Xi’an attracts huge crowds of (predominantly Chinese) tourists every year thanks to the Terracotta Warriors in the Mausoleum of China’s first emperor. However, having read “The Journey to the West”, I was keen to see another of Xi’an’s fabled attractions: the Giant Wild Goose Pagoda. Despite the city’s former magnificence during it’s golden days as the Tang Dynasty capital, Chang’an (618-904 AD), modern Xi’an presents a rather workaday face to travellers flying in to Xianyang International Airport. I arrived from Beijing on an overcast October afternoon after several days touring the Chinese capital’s sights from Tiananmen Square to the Forbidden City and further afield, the Great Wall. Located south and east of Beijing, Xi’an is one of the four great ancient capitals of China, and was the eastern terminus of the Silk Route. It is still an important provincial city with a population of about 10 million. On the way to the hotel, our guide, who called himself “Fish” because he said we would have too much trouble pronouncing his real name, pointed out Xian’s massive 14th century fortifications, one of the oldest and best preserved Chinese city walls, now set well within the city limits. Xi’an seemed a bustling, prosperous metropolis, and our hotel was a modern high-rise rise in the commercial area of the city. Near the hotel was a large park where people congregated each morning to practice Tai Chi. The Giant Wild Goose Pagoda was built in the mid-7th century AD to house the Buddhist sutras brought back from India by the travelling monk Xuanzang, who then translated them from the Sanskrit into 1,335 Chinese volumes. Tall, beautiful and spectacular, the pagoda is an impressive structure 64 meters high made of brick and wood, and is visible for quite a distance. 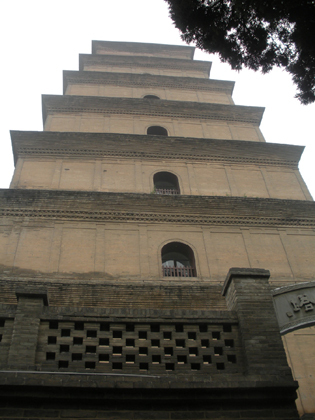 It survived both the devastation of Chang’an during the collapse of the Tang dynasty and the massive Shaanxi earthquake of 1556 which reduced the pagoda’s height and gave it a slight westward lean. Set just to the south of the Xi’an city centre, the pagoda stands atop a flight of decorated steps in a vast paved, walled garden which are the grounds of the Temple of Great Maternal Grace, Da Ci’en. This temple was originally built in 589 AD and then rebuilt in around 650AD by Li Zhi (later the third Emperor of the Tang dynasty) in memory of his mother the Empress Wende. A statue of the monk Xuanzang greeted us visitors as we headed for the pagoda. I had read about the mythical adventures of Xuanzang in “The Journey to the West”, translated from Chinese by a scholar named Anthony Yu at the University of Chicago. The book is one of the four great classical novels of Chinese literature – a sort of fanciful scholarly treasure, full of the extraordinary undertakings of the monk and his companions/bodyguards: a mischievous monkey god, Sun Wukong, who Xuanzang rescues after the monkey had been caught stealing sacred “peaches” (actually persimmons) from heaven, a dragon prince who acts as Xuanzang’s steed, a pig god, and a man-eating sand demon. The Monkey had been locked inside a stone because of his bad behavior, but the Goddess of Mercy, Kuan Yin, gave him another chance, allowing him to accompany the Monk and his entourage from China to India to get the ancient Buddhist scriptures. He had to wear a metal ring around his head, which would allow the Monk to keep him in line. If he misbehaved (and he often did) the Monk was allowed to tighten the ring. The Monkey had an amazing “compliant rod” which is described as a giant embroidery needle, which he kept behind his ear and which could grow to an enormous size if needed, for battles. “The Journey to the West”, in this translation, is considered a primary source for understanding of cultures in the East. The tales are fanciful, and the small group of pilgrims are assailed by all sorts of demons, monsters and spirits on their trip from China to India. These adventures are seen as symbolic expressions of the search for enlightenment through the difficulties of life, but they make for great fantasy reading since such incredible, visual things occur. Women turn into giant spiders, food is transformed, there are marvelous battles between the monk and his entourage and all manner of creatures and spirits. It was a wonderful book. 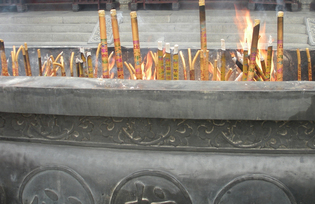 When we climbed the steps to the base of the pagoda, we found an area where you could pay tribute to your ancestors and deceased relatives by lighting large joss sticks and candles. There was a large coal fire inside a waist-high open-pit metal oven where lighted joss sticks were placed, while a small metal pot near the candle rack contained a fire to light them. Bright pink lotus candles were also on sale. There was a good panoramic view of Xi’an from there. Inside the dimly-lit building at the base of the pagoda (which also doubled as a gift shop) the space was filled with statues of the Buddha and parchment scolls on display in glass-covered wooden cases. They may have been replicas of the original sutras brought by Xuangzang from India, which would obviously be extremely fragile. There were quite a few tourists but not nearly as many as those we found later on at the Terracotta Warriors. Our visit to the pagoda ended here as unfortunately access to the upper storeys was not possible on the day we visited. So we missed out seeing the Tang era engravings of the Buddha which cover the walls as well as an apparently fabulous view from the top. To distract us from our disappointment Fish recounted the legend of how the Pagoda got its name. 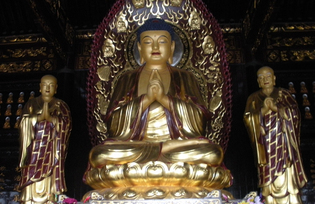 In ancient times Buddhists were divided into two groups: those who ate meat and those for whom meat was taboo. One day a group of monks from the former sect were unable to find any meat to buy. On looking up they saw a flock of big wild geese flying above them. One of the monks said to himself: “We have no meat today. Let us hope that the all-merciful Bodhisattva will give us some!” At that moment one of the geese fell to the ground – it’s wings broken. This was seen by the shocked monks as a sign from Bodhisattva and an admonition for them to be more pious. They established a pagoda on the spot where the wild goose fell and never ate meat again. 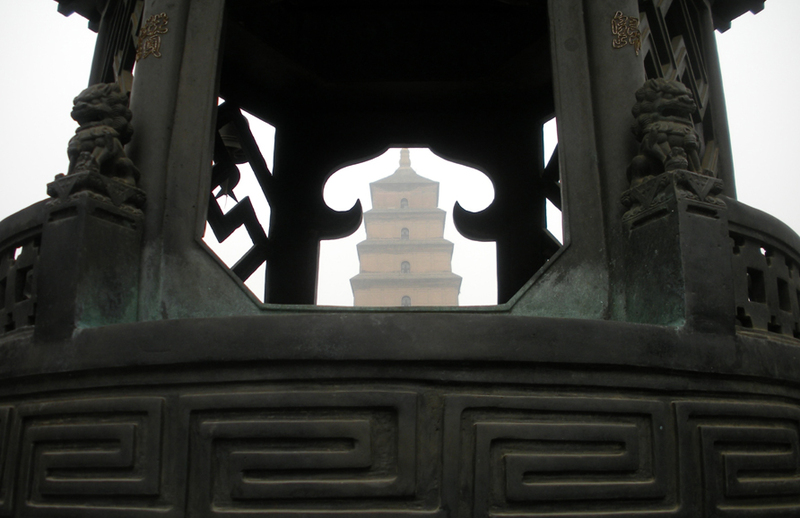 And that is how the Wild Goose Pagoda got it’s name….. Well, it’s a good story anyway!